The Manitoba NDP has claimed a historic fourth majority government while prompting Hugh McFadyen to step down as leader of the Progressive Conservative Party. What was expected to be one of the most competitive Manitoba elections in over a decade — the province's 40th general election — turned into another strong showing by the New Democrats and more of the same from the PCs. The NDP won 37 of the province's 57 seats, and every one of the ruling party's 16 cabinet ministers who sought re-election was voted back in. The PCs earned 19 seats while the Liberals won a single riding. The popular vote was much closer, with the NDP receiving 46 per cent compared with the PC's 43.9 per cent. The Liberals earned 7.5 per cent. 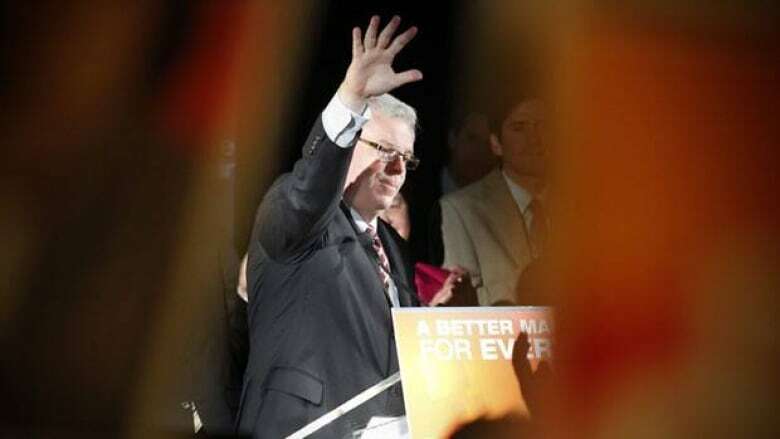 "Today, Manitobans went to the ballot box and voted for optimism," NDP Leader Greg Selinger said in his victory speech. "Never have I been so optimistic as I am tonight about the future of Manitoba. To all who voted, I thank you for participating, thank you for getting involved in the democratic process." Selinger choked back tears as he thanked his family for their support through the campaign. He said the party will enjoy the victory Tuesday night but "tomorrow we will roll up our sleeves and get back to work for Manitobans." Reacting to McFadyen's decision, Selinger said: "I honestly wish he would have taken more time to think about it." A Probe Research poll released four days ago and conducted for the Winnipeg Free Press pegged NDP support at 46 per cent and PC support at 43 per cent. Selinger entered his first provincial election as party leader after taking the reins when Gary Doer stepped down in August 2009 and became Canada's ambassador to the United States. Doer led the New Democrats to a record three consecutive majority governments, earning a larger majority each time. The Liberals, meanwhile, have been fighting for their survival on the political map with just seven per cent support. Liberal Leader Jon Gerrard managed to hold on to the single seat his party had in the legislature — his own in the Winnipeg riding of River Heights — but no other Liberals were elected. The question of whether Selinger could win the 29 seats required for a majority — or even hold on to the NDP's governing role — manifested in a negative campaign defined by attack ads. The ads accused McFadyen of having a secret agenda to privatize Crown corporations such as Manitoba Hydro and parts of the health-care system. The NDP's aggressive approach began in November 2010 with the election 11 months away. It set the PCs on their heels and forced them into a defensive campaign, posting billboards denying any privatization plans. It wasn't until later in the campaign that the PCs rallied with their own attacks, accusing the NDP of going easy on criminals and of having a secret plan to raise the provincial sales tax. The Conservatives also fired a shot at the NDP in cyberspace, buying the domain name for todaysndp.com, which is similar to todaysndp.ca, the official NDP website. The Tory version used the familiar NDP orange and a big image of Selinger, but was filled with allegations of broken NDP promises. The tight race prompted a pair of prominent former Liberal MPs announced their endorsement of two NDP candidates. In a mailout to people in the hotly contested Winnipeg riding of Seine River, Anita Neville and John Harvard expressed support for the NDP's incumbent candidate Theresa Oswald. Harvard also expressed in a letter to constituents that he supported NDP incumbent Sharon Blady in the Winnipeg riding of Kirkfield Park. 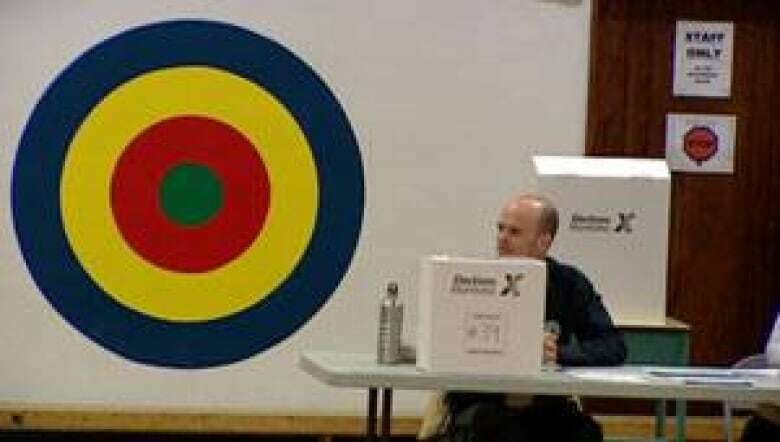 The letters noted a strategic vote was necessary in those ridings to keep out the Progressive Conservatives. Analysts have said a positive economy and negative ads likely turned around an election that once looked like certain defeat for the NDP. A poll released in March 2010 by Angus Reid, suggested 44 per cent of respondents would vote for the Tories while 37 per cent would support the NDP. In September 2010, another Angus Reid poll showed support for the PCs had increased to 49 per cent, while support for the NDP fell to 34. But the New Democrats rebounded in 2011, benefiting from a low unemployment rate, a strong housing market and even the return of the Winnipeg Jets, according to analysts. Prior to the vote the New Democrats held 36 seats in the 57 seat legislative assembly. The PCs held 19 seats, and the Liberals one. One seat was vacant. That seat had been held by Liberal Kevin Lamoureux, who left it for federal politics. He won a byelection in the federal riding of Winnipeg North in November 2010 and was re-elected in the May 2011 general election.